Nancy Pelosi cleared the first hurdle to serve as House speaker by winning Democrats’ nomination Nov. 28, leaving her detractors one last opportunity to attempt to block her when the entire chamber votes in January. Democrats voted 203-32 to nominate the California lawmaker during a closed-door meeting. The number was short of the 218 votes she eventually needs to prevail on the House floor Jan. 3 if all members are present and cast a ballot. But some dissenting Democrats are likely to support her at that point if the alternative is a Republican. 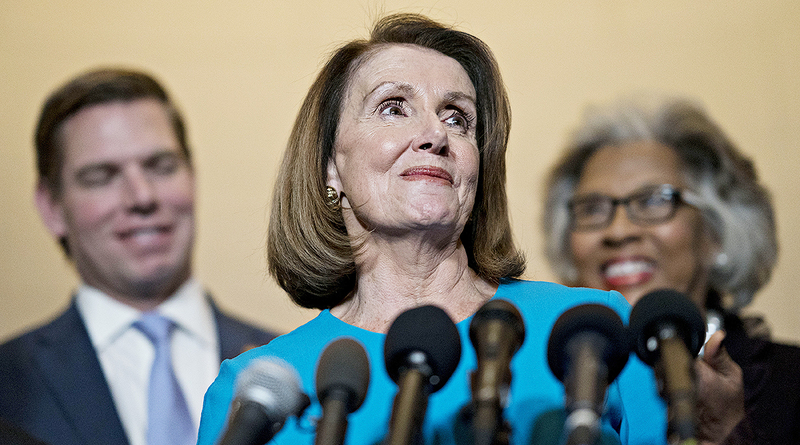 Although Pelosi, 78, ran unopposed, a core group of Democrats argue the party needs new leadership from a younger generation of lawmakers. They pledged to vote against her and say she still doesn’t have enough support to win the floor vote, even as some of their members reversed course to say they were open to voting for her. Pelosi gave the green light for some Democrats to vote against her, including those who pledged to oppose her during their campaigns, with the understanding that they would back her on the House floor in January, according to a person familiar with the matter. This is a crucial moment for the party that swept into power after November’s midterm elections and will use its new House majority to provide a counterpoint to President Donald Trump ahead of the 2020 elections. Pelosi’s supporters say she’s a skilled tactician and can balance the demands of energized progressives pushing for a more liberal policy agenda while protecting centrist members who won traditionally Republican districts. The incoming House speaker will have to work with a Senate and White House controlled by Republicans, which is likely to mean few legislative accomplishments for either party.